Vizcaya Museum and Gardens was built between 1913 and 1916 as the private winter residence of industrialist James Deering, Vice President of International Harvester Company. The Villa and formal gardens are a superb example of Italian Renaissance Revival architecture, intended to give the illusion of having been built in the sixteenth century. Miami-Dade County bought the property from family heirs in 1952. It is currently managed and operated under the governance of the Vizcaya Museum and Gardens Trust. 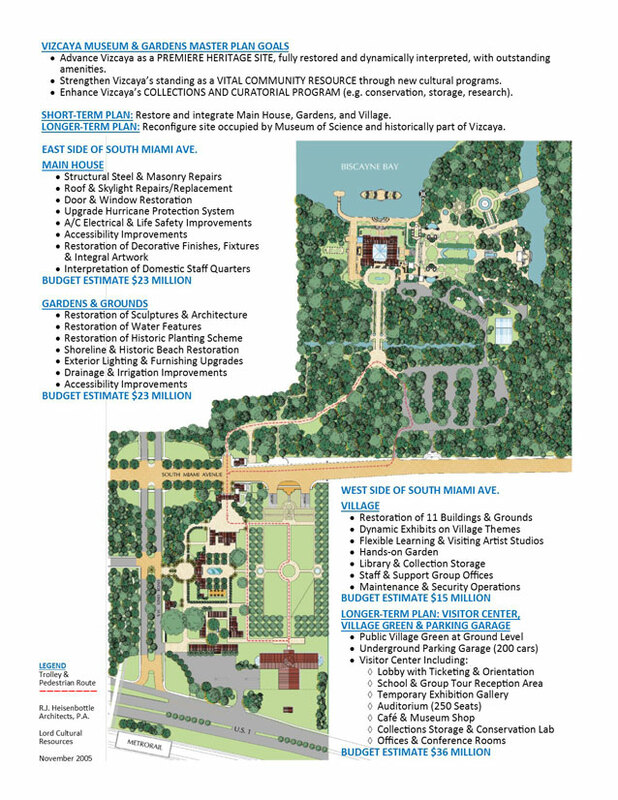 Between 1998 and 2002, RJHA was part of a multidisciplinary team headed by Lord Cultural Resources that prepared a Master Plan for planning, design and development opportunities within Vizcaya Museum and Gardens. The plans call for progressive restoration of the Main House and Garden, restoration and reuse of the Village buildings as staff and exhibit space, construction of an underground parking garage below a garden park setting and a Visitors Center with exhibit space and auditorium. Master Plan goals included advancing Vizcaya as a Premiere Heritage Site, fully restored and dynamically interpreted with outstanding visitor amenities; strengthening Vizcaya’s standing as a vital community resource through new cultural programs; enhancing Vizcaya’s collections and curatorial program.